With the excitement of FROZEN about to be released on DVD, my daughter and I made homemade Olaf play dough this week. The easy recipe is perfect for home or the classroom and has just enough orange, black, and white glitter sparkles to match Olaf. 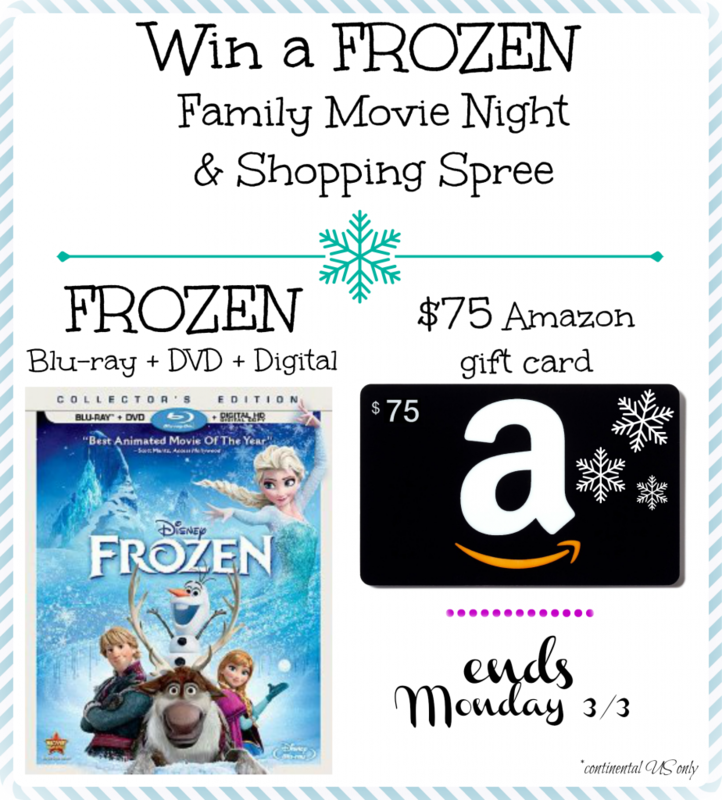 I’ve also joined some of my favorite Disney loving friends to give away a FROZEN family movie night complete with a Blu-ray/DVD/Digital copy of FROZEN the day it releases and a $75 Amazon gift card. Disney’s FROZEN will be released and available for purchase March 18, 2014. Add vegetable oil and stir. Then add hot water and stir until all ingredients are completely mixed together. Allow to cool then remove from bowl and knead with hands until soft dough is formed. Spend the next few hours making snowballs with Olaf. Or you could use his bottom to stamp hidden mickeys into the snow. If you’re looking for a fun FROZEN themed breakfast, try making my Olaf donuts and snowflake pancakes. Are you ready to enter to win a FROZEN family movie night and shopping spree? See the instructions below and cross your fingers. Good luck! Welcome to the FROZEN Family Movie Night & Shopping Spree Giveaway! We’re joining together to give our readers the chance to own the Disney animated hit FROZEN and take their family on a virtual shopping spree. One winner will receive a $75 Amazon gift card and a Blu-ray/DVD/Digital copy of FROZEN the day it releases, 3/18/14. Hi! Great ideas! Thanks! Where did you find the Olaf plastic figure with a hidden Mickey bottom? The plastic Olaf came with the toddler Elsa doll I purchased from Walmart for my daughter’s birthday. There’s a picture of him in the box with Elsa in the post about celebrating my daughter’s birthday with FROZEN.